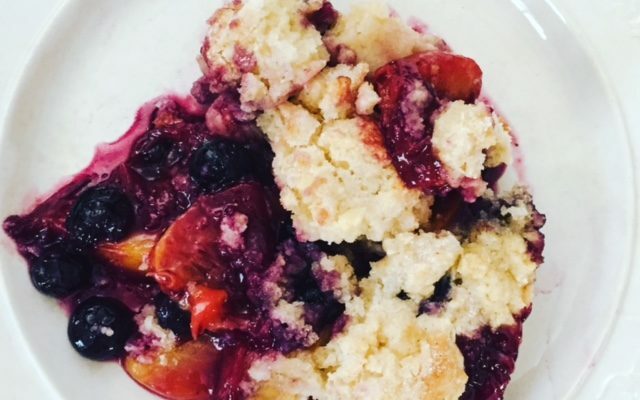 Just in time for summer and the beautiful local produce that abounds, I share with you this yummy cobbler that can be made with any ripe fruit on hand. In the winter I make this recipe wth apples or pears and sometimes include frozen blueberries as I love them so. Heat the oven to 400. Grease a 13 by 9 baking dish. Combine the sugar, fruit, butter, cinnamon and zest, in the baking dish. Bake for 10 to 15 minutes until bubbly. Meanwhile combine the flour, corn meal, baking powder and salt in a large bowl. Add the butter and blend with two knives or a pastry cutter until the mixture is crumbly. Using a fork stir in the 1 cup of cream just until the dough comes together. Do not over-mix. Scatter the dough over the top of the fruit. Brush with the remaining 1 Tb. cream and sprinkle with the 2 tsp. sugar. Bake until golden brown about 25 to 30 minutes. Meanwhile whip the cream in a cold bowl with the confectioner’s sugar and vanilla until soft peaks form. Allow the cobbler to cool for 20 minutes and serve either warm or room temperature with the whipped cream. Mix the apples, sugar, flour, cinnamon, vanilla, salt and lemon in a large bowl. Add to the buttered baking dish and cover with the batter. Bake as above.